The Virtual Wife: Natural Beauty, Simple and Cheap - Washing your Face with Oil? Natural Beauty, Simple and Cheap - Washing your Face with Oil? A couple weeks ago, while reading one of my favorite blogs (www.scarymommy.com), I read about something called the Oil-Cleansing Method which is a whole new way to wash your face. Basically, instead of using cleaners for your face which contain detergents and strip your skin of your natural oils, you actually use oil to wash your face. I know it sounds silly, but the theory is that most cleansers strip your face and cause your skin to create excess oil. Therefore, by washing with natural oils, it actually counteracts your own oil and helps clear and moisturize your skin.Oil dissolves oil. I did a lot of research on this topic before I dove in (see some links at the end of the blog) to make sure I did it just right. I figured, if it didn't work, what did I have to lose. The thing about making your own oil cleanser, is that you can play around until you get it just right. The combination of oils you use depends on the type of skin you have. 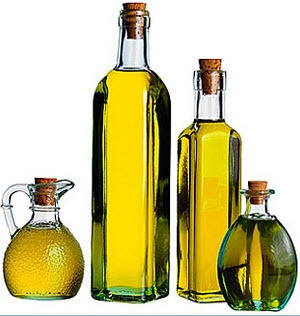 The first oil is Castor Oil and it is the most important one. You can find it in most drug stores as it is used as a laxative. I found mine in CVS, you may have to ask if you don't see it. Castor Oil has potent anti-inflammatory properties, and is also known to have healing and cleansing priorities. In other words, it will draw out the impurities in your skin. However, Castor Oil is potent and can be very drying. This is where the second oil comes in. The majority of the articles I read said to use Extra-Virgin Olive Oil as the second choice. I read in a couple places that Sunflower Seed Oil works as well and feels a bit more luxurious. But I since I couldn't find that easily and I already had the Olive Oil so I went with that. Pull my hair back and wash and dry my hands. I pure some oil into my palm, about the size of a quarter and rub my hands up to warm the oil up. I massage the oil on my face and neck. Take a hot, wet facecloth and lay it over my face to open my pores. You can do this multiple times if you like. Then I rinse the facecloth and use it to take the oil off. It's really easy and it feels like a mini massage every night. If you need to exfoliate, just add some sugar to the oil, simple as that. They say it takes a few days for your skin to adjust and adapt to being clean and clear of blockages. I didn't have any problems though and honestly love the way it makes my skin feel. I have also read that you won't need to moisturize your skin after cleansing with oil but I still do. Coming soon....why I will never use shampoo again! I have also heard (and used) coconut oil in the same manner, it is supposed to have good face clearing properties and makes your skin super soft!